Since all my friends simultaneously decided to hop on the baby train about a year ago, I’ve been making adorable (if I do say so myself!) 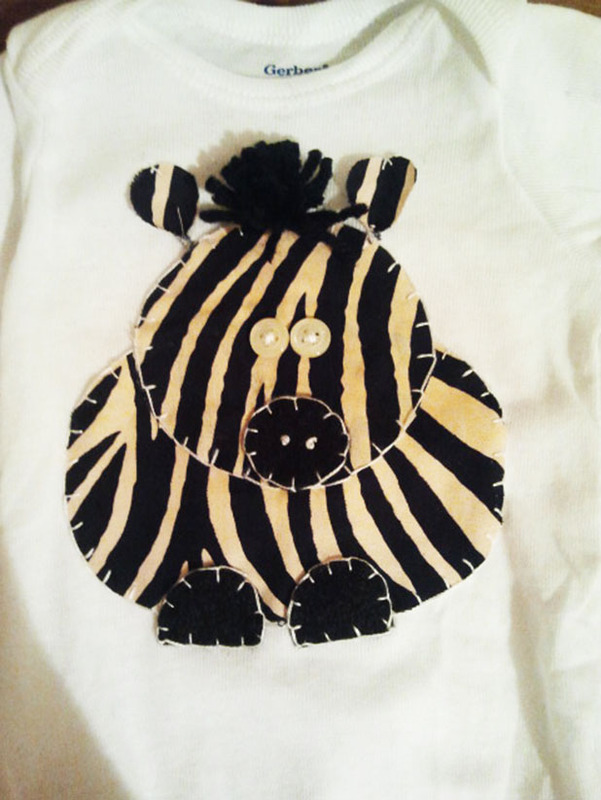 hand-sewn onesies for the little booger machines. I’ve given a sneak peak before in my previous post showing what I made my nephew for Christmas and now it’s time for a tutorial! This week I made a couple onesies for some cute little baby girls and took pictures along the way. 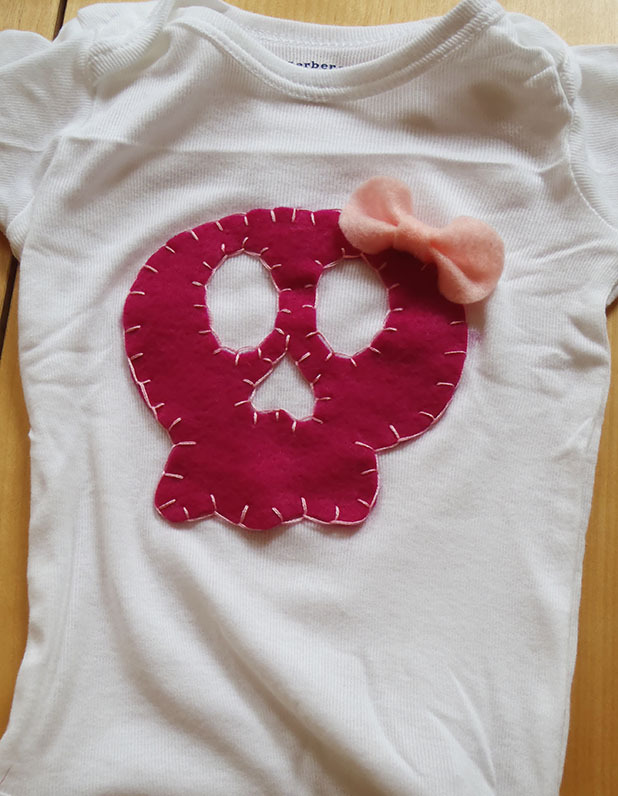 Check out this cute skull with a bow onesie! 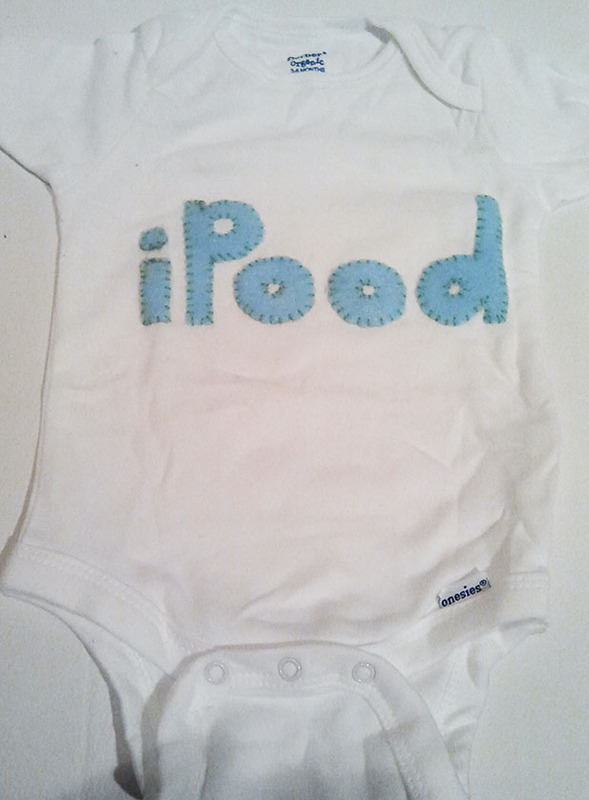 Seems like for a new born baby you’d buy the newborn size (0-3 mos.) onesie, right? Not always. Some of my friends have birthed behemoths….er….I mean, healthy-weight…..babies that actually never fit the 0-3 mos. clothing size. You might want to consider purchasing a 3-6 mos. onesie, the baby can always grow into it! 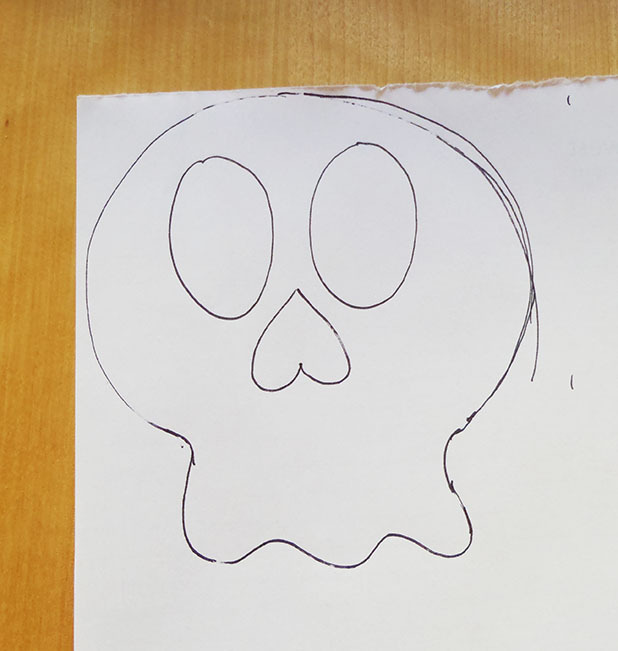 When getting started I take the time to first sketch my pattern out on a piece of paper. This gives the nice advantage of reproducibility if I save the paper template for future projects. 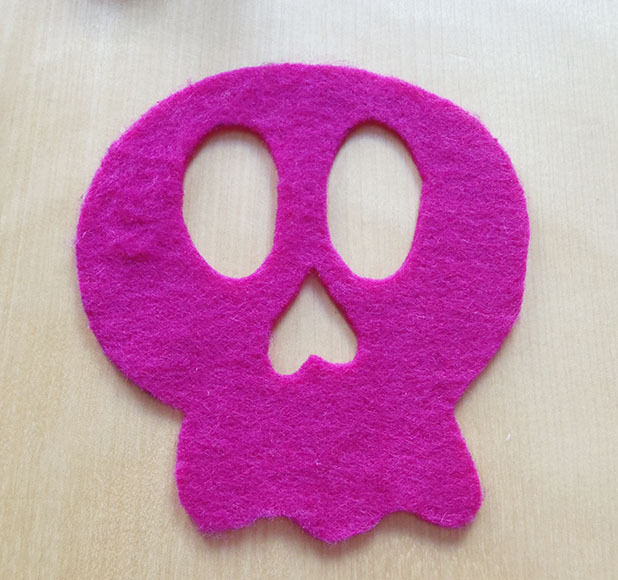 Use this template to trace out your pattern onto a square of felt and cut the pattern. 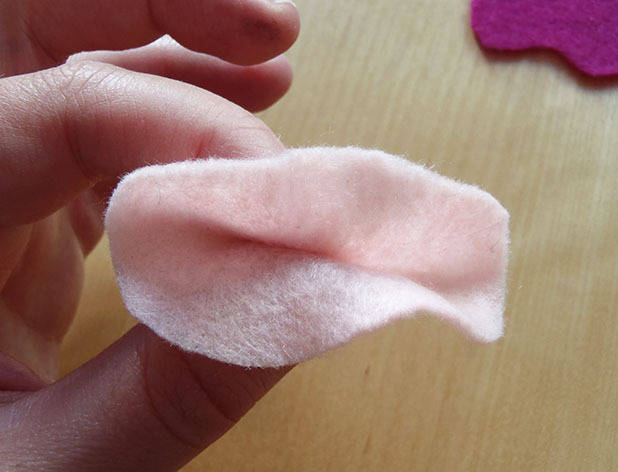 Although I reinforce the felt with embroidery, I always like to first adhere the felt to the onesie with fabric glue. 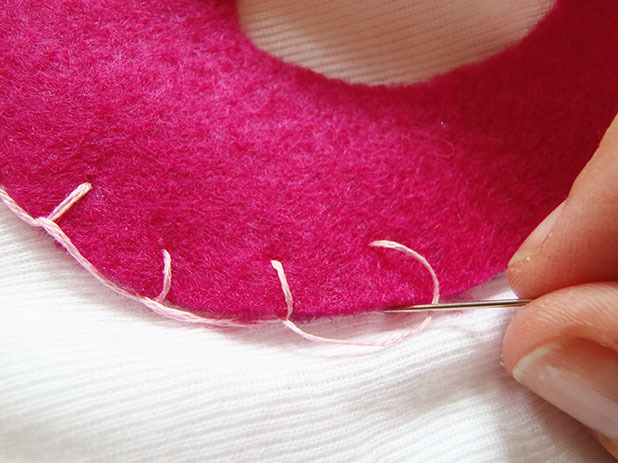 This helps to hold the applique in place while I’m sewing and adds a little extra strength to the final product. 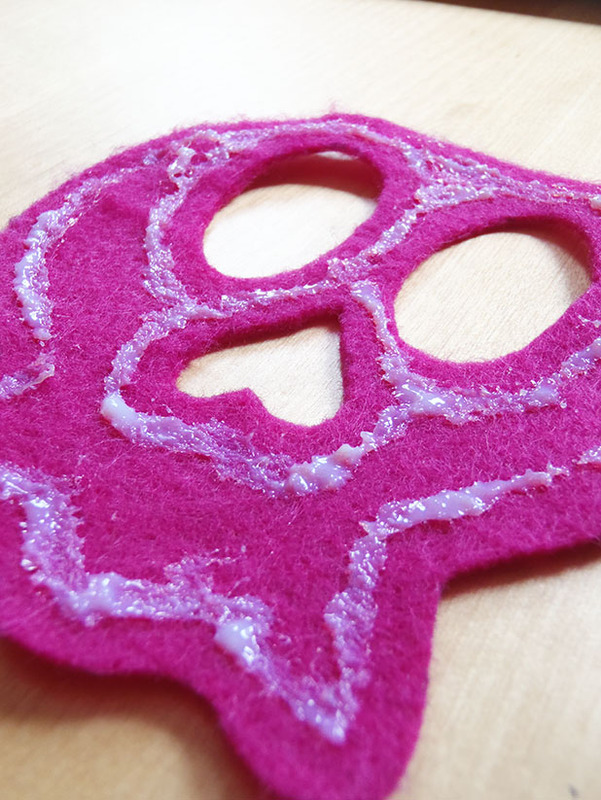 I use bottled glue instead of spray glue because I find that when working with small pieces of fabric like this, the spray glue can get a little messy. 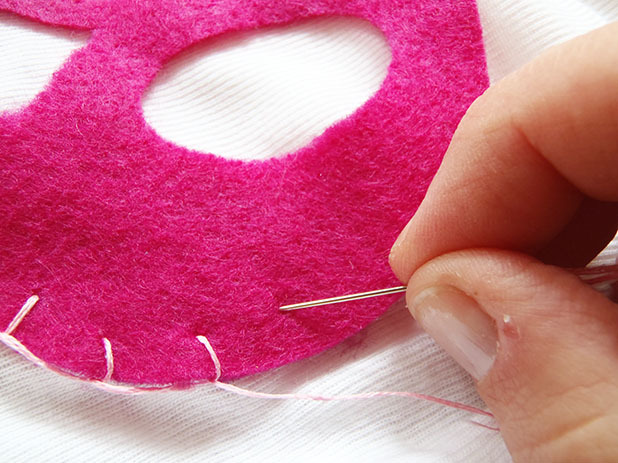 I try to keep the glue away from the edges where I’ll be sewing because putting the needle and thread through the glue repeatedly really gums it up and leads to tangling while trying to embroider. 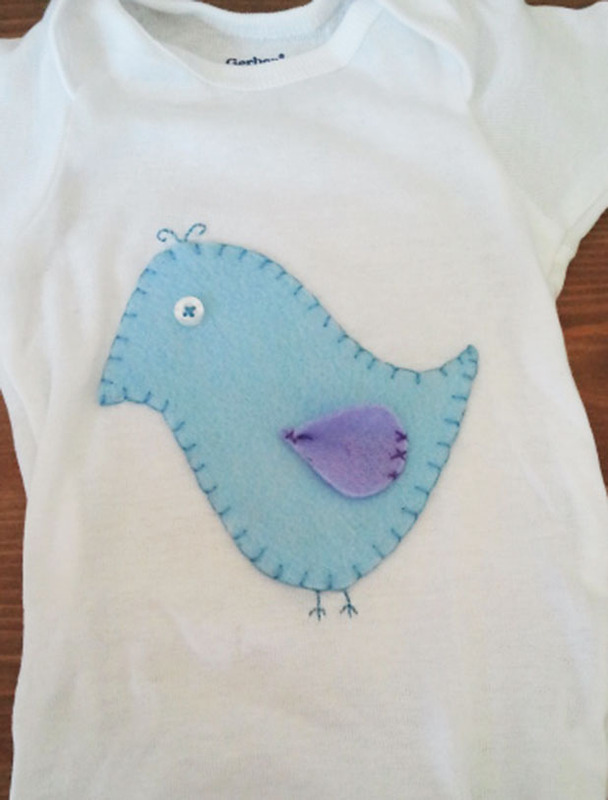 Center your felt cutout on the onesie. 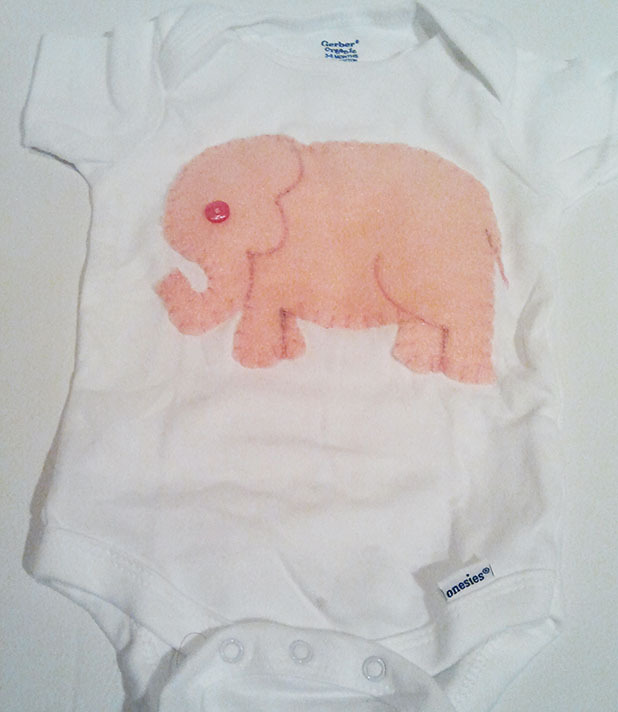 I usually try to position it so that it will center on the child’s chest, but it can be pretty cute to sew something to the bum of the onesie. For both a decorative detail and additional strength, I embroider around the edge of the felt with a complimentary color of embroidery floss. 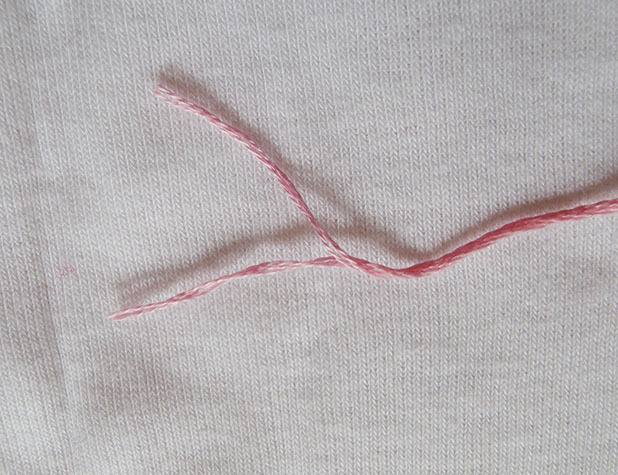 Standard embroidery floss is actually composed of 6 thin threads. 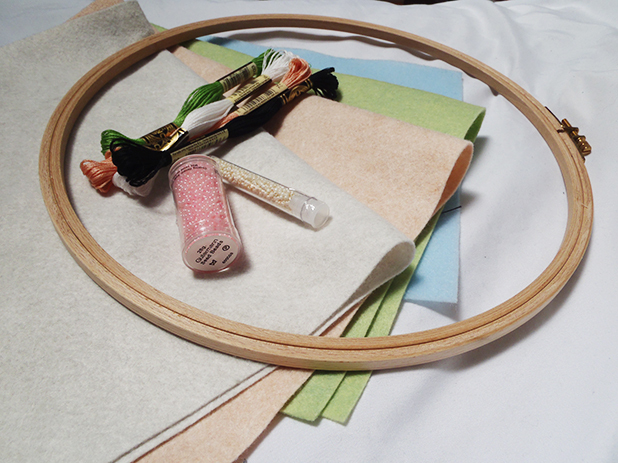 I find it is too difficult to work with the floss at full thickness so I separate out 3 strands to embroider with. 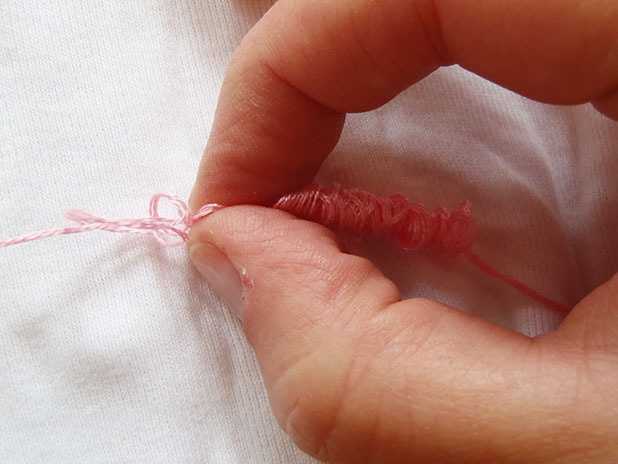 Just hold on to the 3 you want to use, gently pull on the 3 you’re setting aside and it should separate pretty easily (the longer your thread, the more likely it is to tangle). 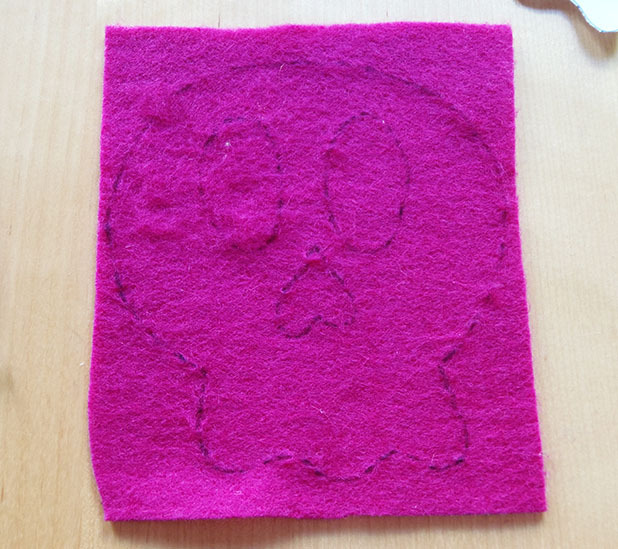 I used blanket stitch to embroider around the edges of the felt applique. 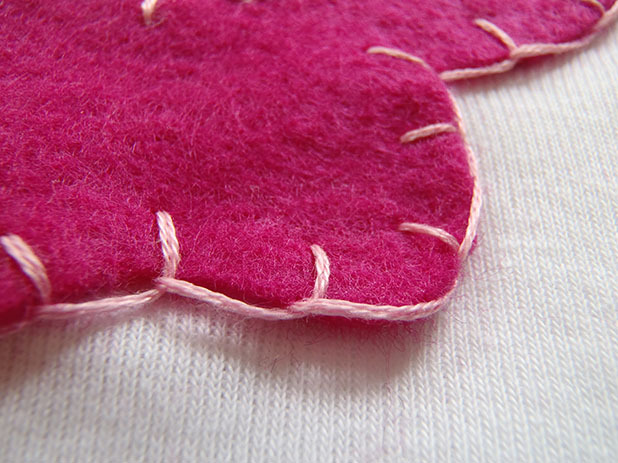 Blanket stitch is a really easy way to add a cute embellishment that I’ve shown before in my double-sided napkin post. 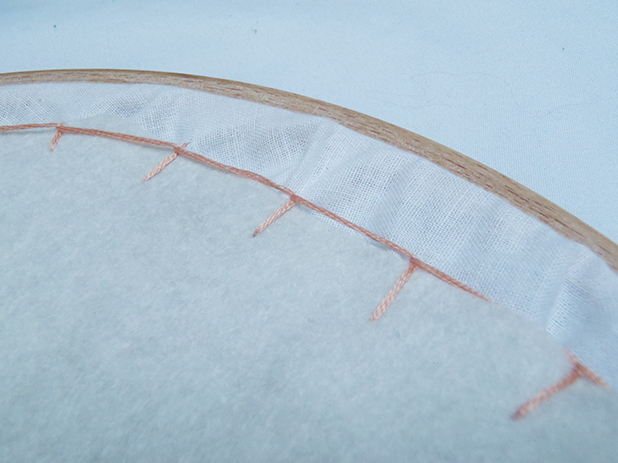 To do blanket stitch, first come up through the fabric from the bottom, then put the needle back down through the fabric about 1 cm over and 1 cm down (or whatever spacing you’d like), and pull the floss through. Leave a little slack in the floss, don’t pull it all the way through. 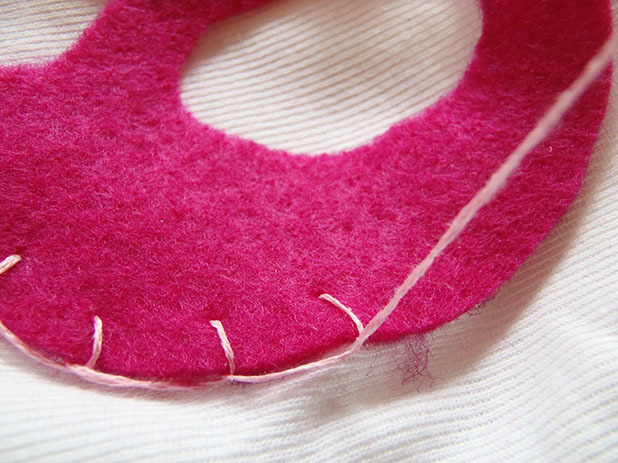 When bringing the needle back up, bring it up on the edge of the felt across from where you brought the needle down. Make sure to bring the needle up inside the loop of floss left on the top. Pull taught. Here’s a nice YouTube video describing the process if you found that a bit confusing. 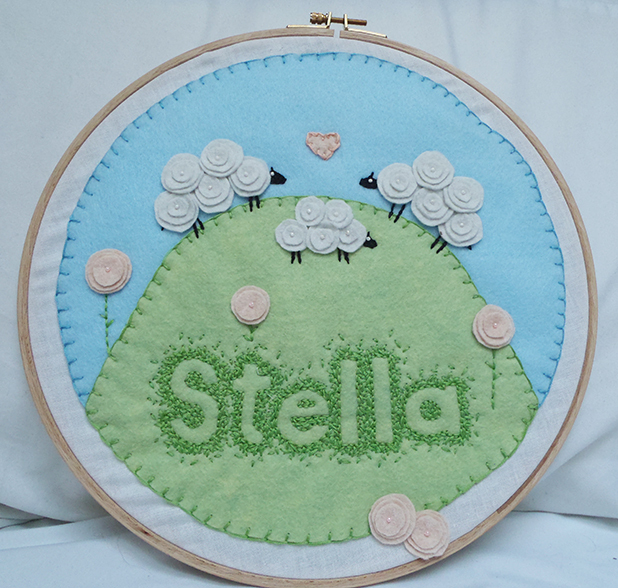 Embroider around all edges of the felt to give it a cute hand-made look. 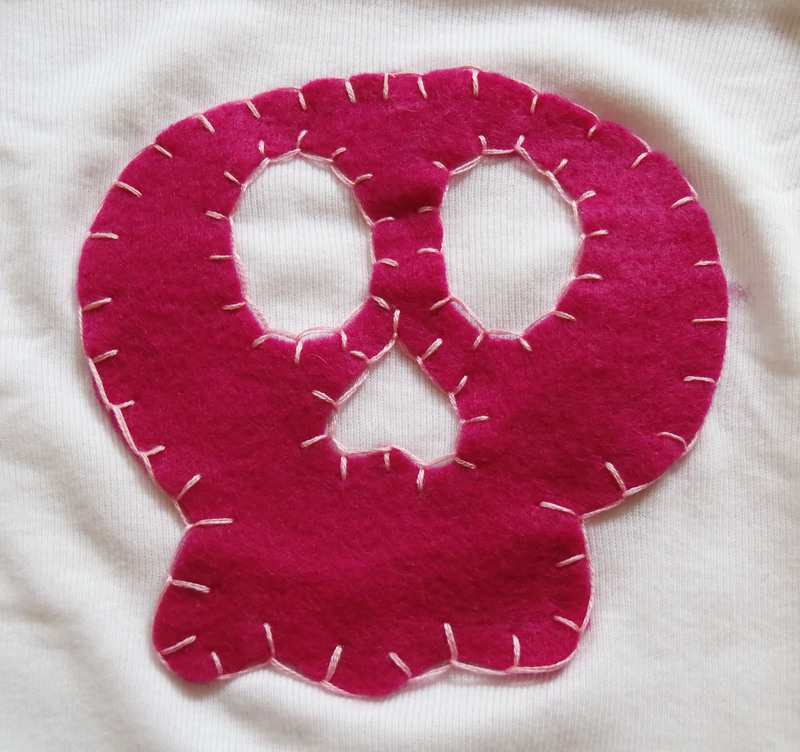 I wanted to add just a touch more sweetness to this little skull so I also cut out a bow in pale pink felt. 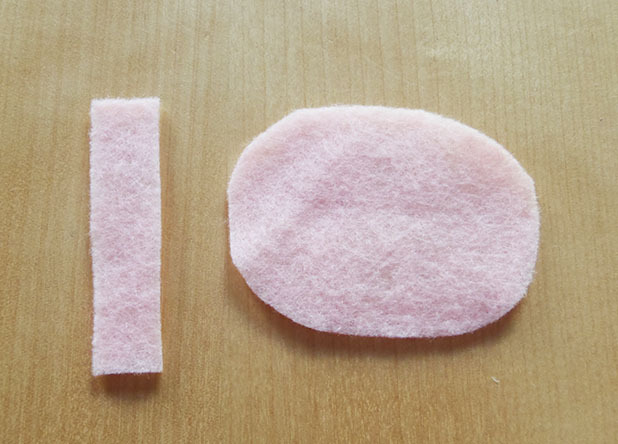 Just cut two pieces, one larger oval and one thin rectangle. 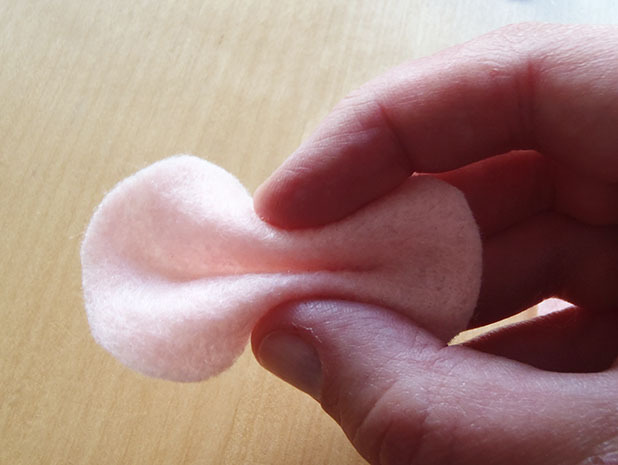 To form the bow, pinch the oval in half along the long edge, then fold the edges back onto themselves. I added a little stitch at this point to hold it together while I used the thin rectangle segment to wrap around the center of the bow and stitched it all together. 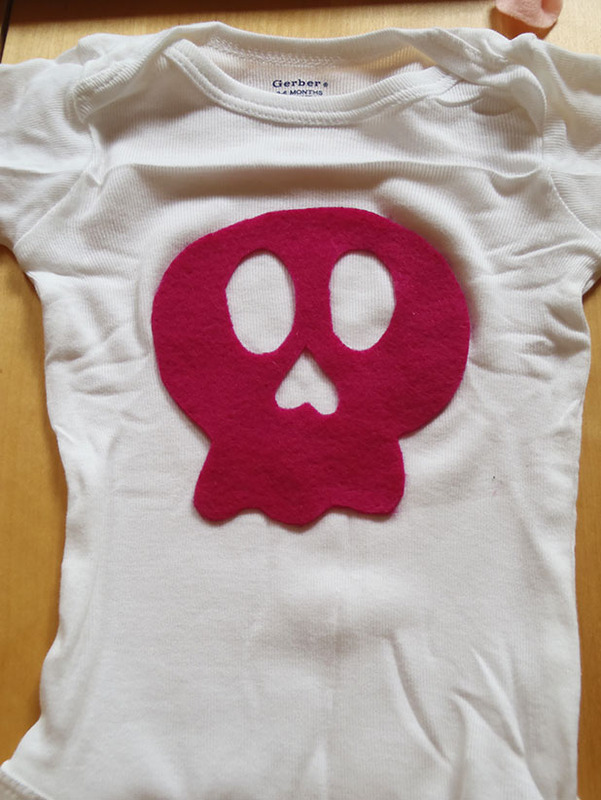 Hand-stitch the bow to the skull and you’ve got one adorable onesie!! I’ve probably made about 20 of these over the past year or so. 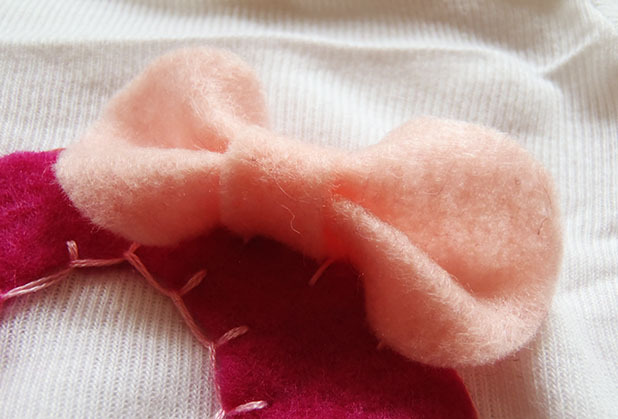 Once you get the hang of it, it usually only takes about 1.5-2 hours to pull a onesie together! I’ve linked this onto parties over at Thirty Handmade Days, So You Think You’re Crafty and Nap Time Crafters. 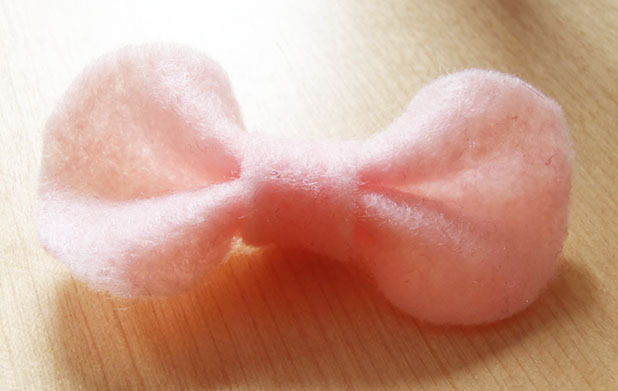 Head on over and see what other crafters have linked to the parties! 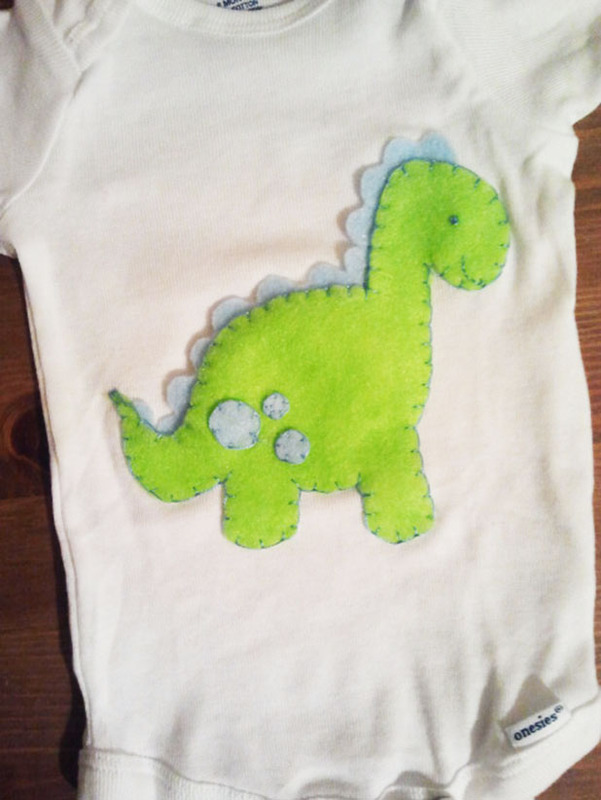 This entry was posted in DIY, Embroidery, For Baby, handmade gift, Patterns and Tutorials, Sewing Projects on August 8, 2013 by missphd. A friend of mine just had a gorgeous baby girl: Stella Joy! 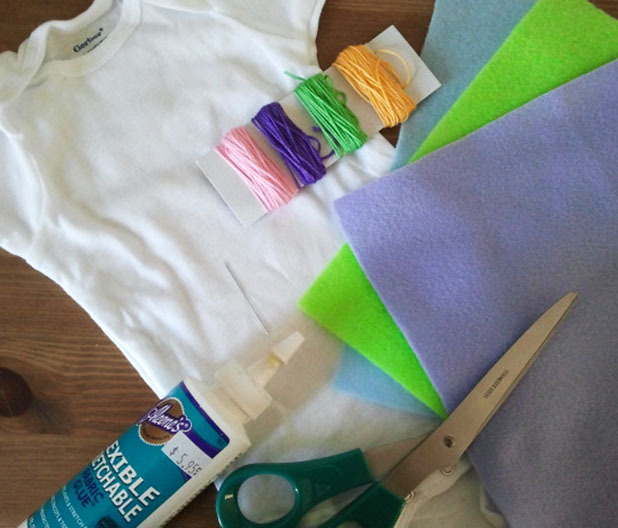 My go-to baby gift is normally a set of felt applique onesies (tutorial, one day! ), but I really dropped the ball with baby Stella and before I knew it….she was here! 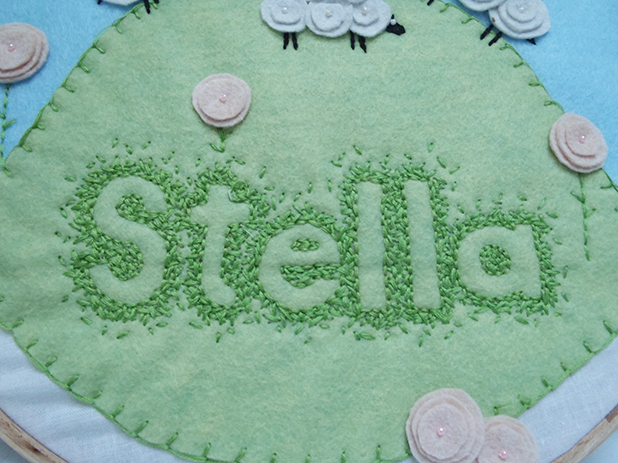 I decided to branch out a bit and, inspired by some things I found on Pinterest here, here and here, I made Stella some baby name art. I’m so happy with how it turned out and I hope her parents love it too! 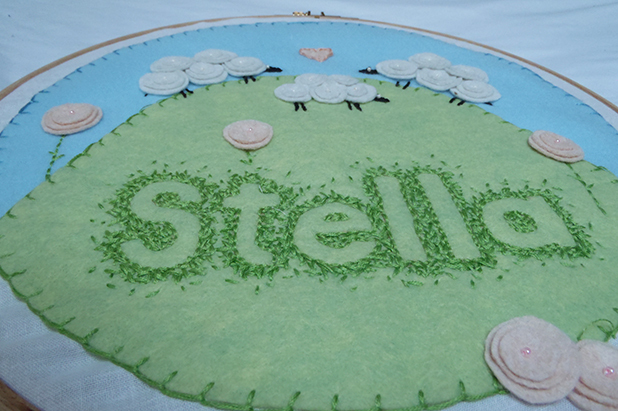 This project wasn’t too difficult, but all the stitching around the name took a lot longer than I expected! 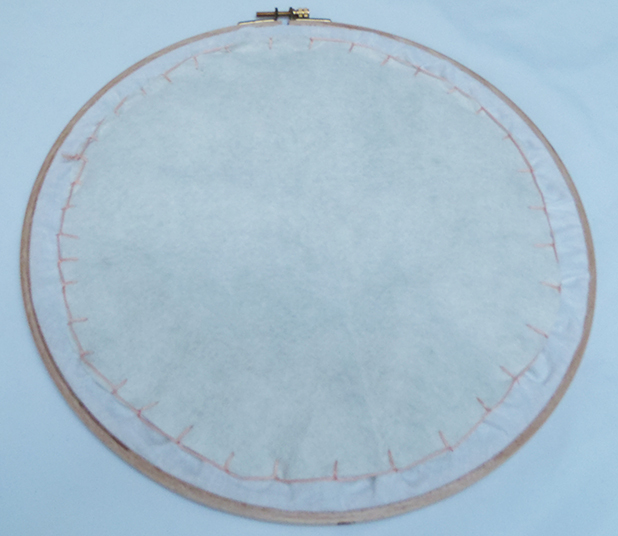 I first cut a large circle from the blue felt, about 1″ diameter smaller than the embroidery hoop and, with muslin secured in the hoop, sewed the blue felt to the white cotton backing using the blanket stitch with blue embroidery floss. I then sewed the green felt on just as I had the blue. 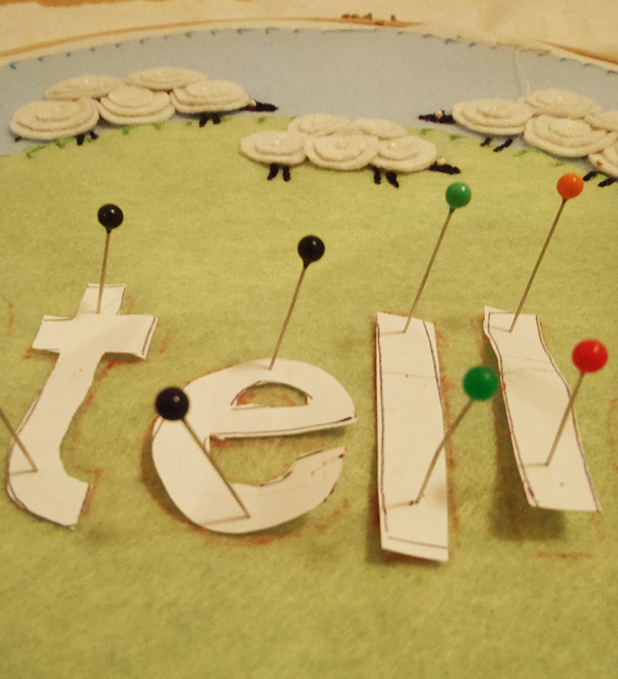 To make the name, I cut paper stencils and held them in place with straight pins while I gently traced around them with a felt pen. (I’m not sure why the color is off in these couple photos, the green is really more of a soft mint rather than the harsh lime it appears here). 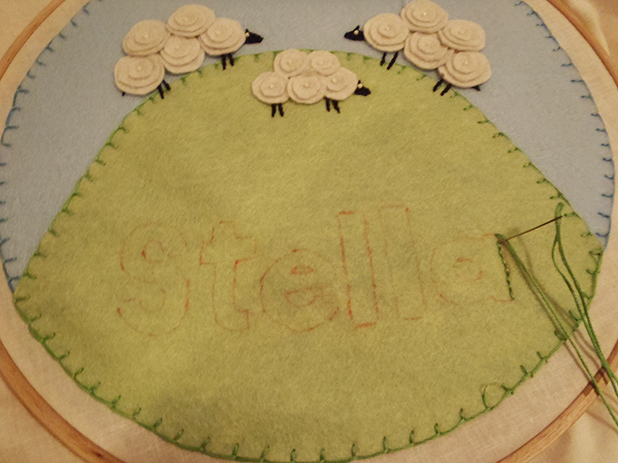 Once I had the name traced onto the fabric I sewed around it using a simple backstitch. 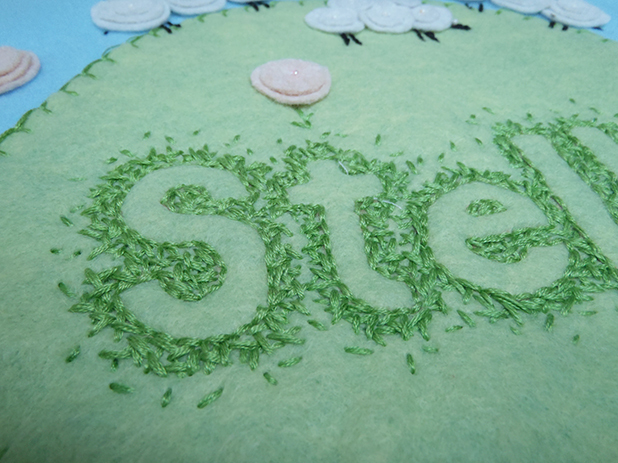 The grassy embroidery effect around the name was created by sewing small straight stitches in a random pattern about a centimeter around each letter. 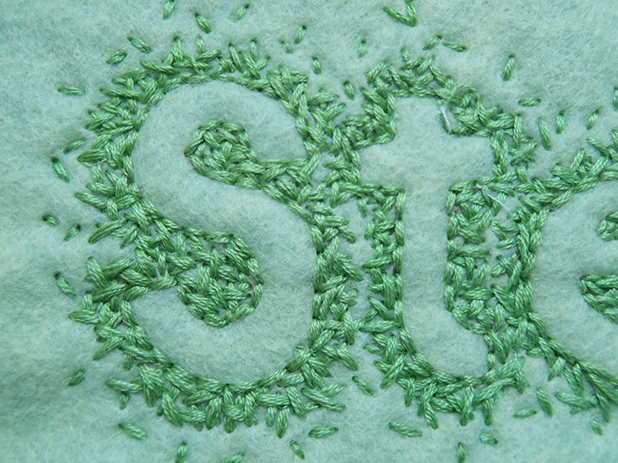 I diluted the stitches toward the edge of the letters to try to give the impression of grass. 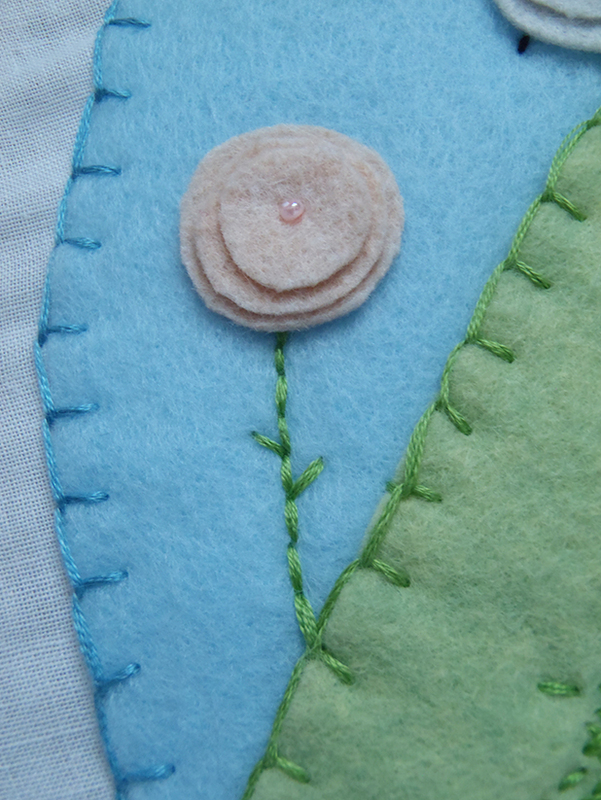 Inspired by something I’d seen on Pinterest I used concentric circles cut out of felt to make some sheep and flowers, adding a seed bead to the center of each for a nice girly touch. 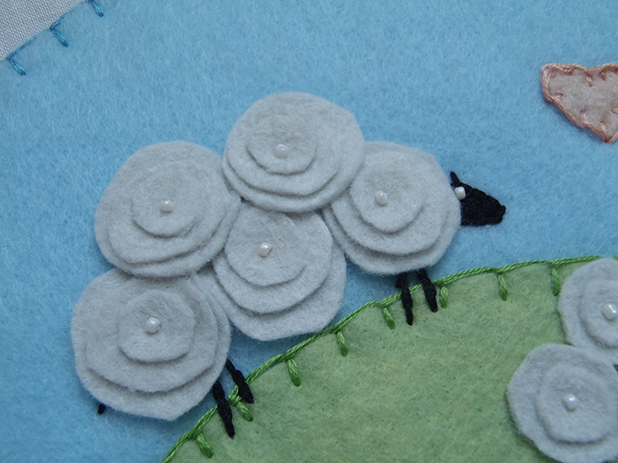 The little sheep legs were made using backstitch and the heads were a simple satin stitch. 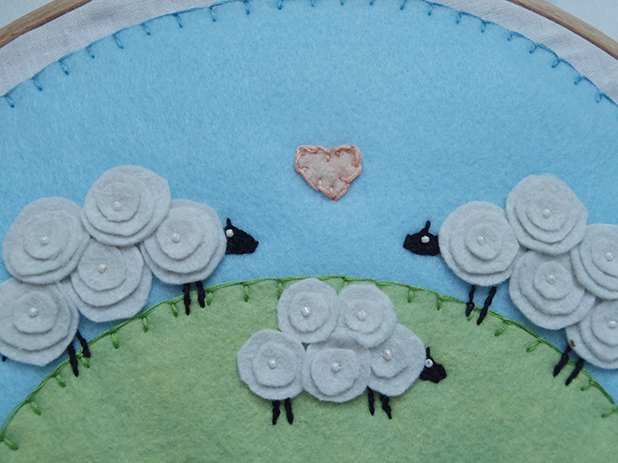 The expanse of blue sky seemed a little vacant when I was done and I was worried clouds would compete with the sheep, so I added a little heart embroidered on using blanket stitch. With the front finished, I wanted to make sure the back looked just as polished, so I tried to finish it as nicely as I could (without wasting too much time on it). Unfortunately, I didn’t take pictures of the process because I was going to just link to another tutorial on a blog I frequent. When I went back to look at it though, I realized that I didn’t actually follow it at all and made up my own method instead after I’d already finished without taking any pictures….whoops! 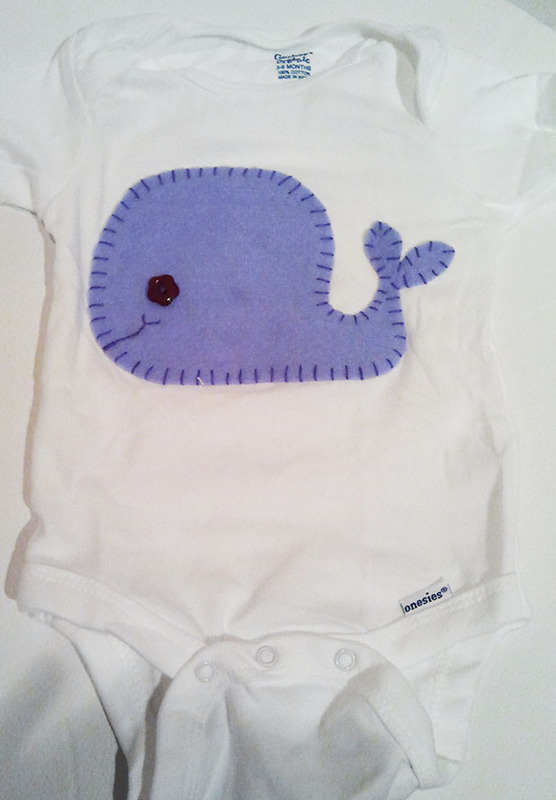 This entry was posted in DIY, Embroidery, For Baby, handmade gift, Patterns and Tutorials, Sewing Projects on May 22, 2013 by missphd.